It's is an entirely separate blog that I created to house all of the latest and greatest news and press releases from your favorite brands. 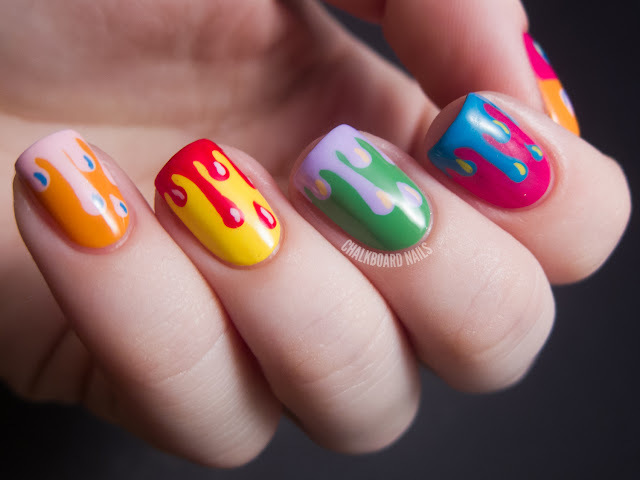 I understand that many of you follow a number of different nail blogs and are potentially seeing the same press releases over and over again every time one comes out. That's part of the reason that I haven't posted them until now! However, I also know that some of you may not be as tuned in to the nail polish community and would like to see these updates. That's where Chalkboard News comes in. 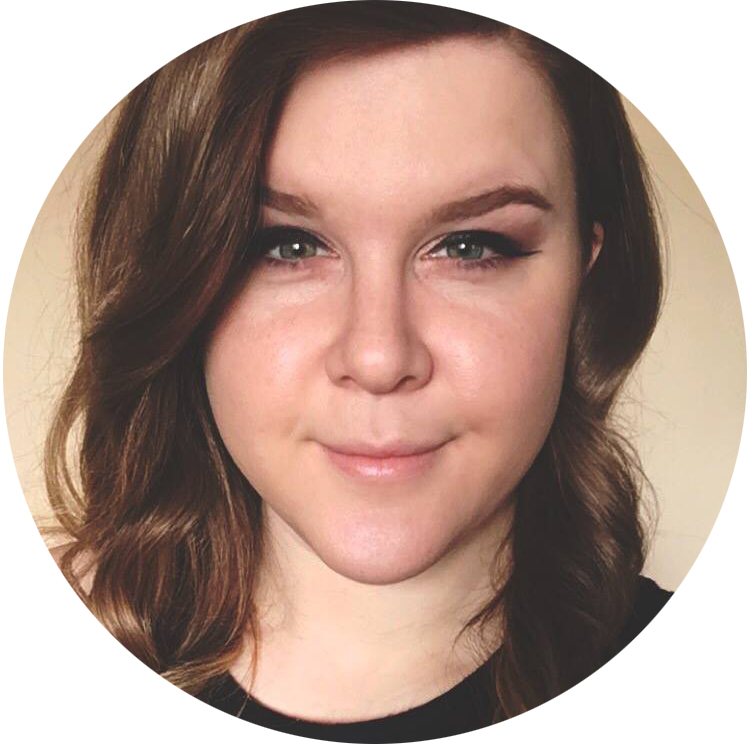 I've preloaded some press releases into the blog so you can get a feel for the type of content you will be seeing there. I will also be adding a few links to it from this blog (navigation bar & sidebar) for quick access in the future. Let me explain to you what you're seeing here. It's Edward, in the middle of a forest, standing on some rocks, exposing his naked upper half to the sunlight. Which, of course, makes him glitter like a disco ball. You can tell by his hair swoop that his head is turned to my right, his left. I'm aware of the "real vampires don't glitter" camp, and I probably even subscribe to it despite having read the Twilight series. But, cmon. 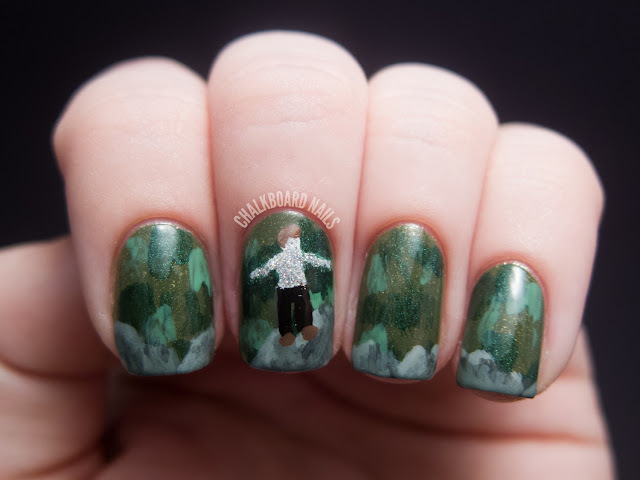 I couldn't resist vomiting glitter all over a tiny nail art version of Edward. The background is Zoya Yara, Zoya Veruschka, and Essie Mojito Madness. The rocks are China Glaze Elephant Walk and then variations of that color made by mixing in white and black. Edward's shoes and hair are OPI Wooden Shoes Like to Know. His body is white, his pants are black, and the glitter is Lacquery Girl Band. 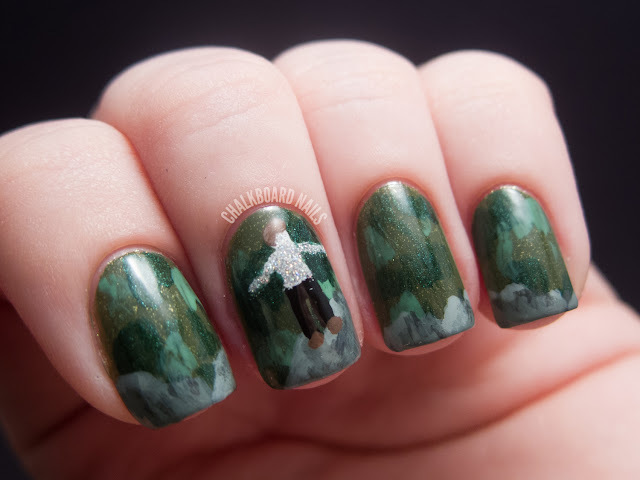 Last year's supernatural nails are here, and challenge prompts are here. Morning! 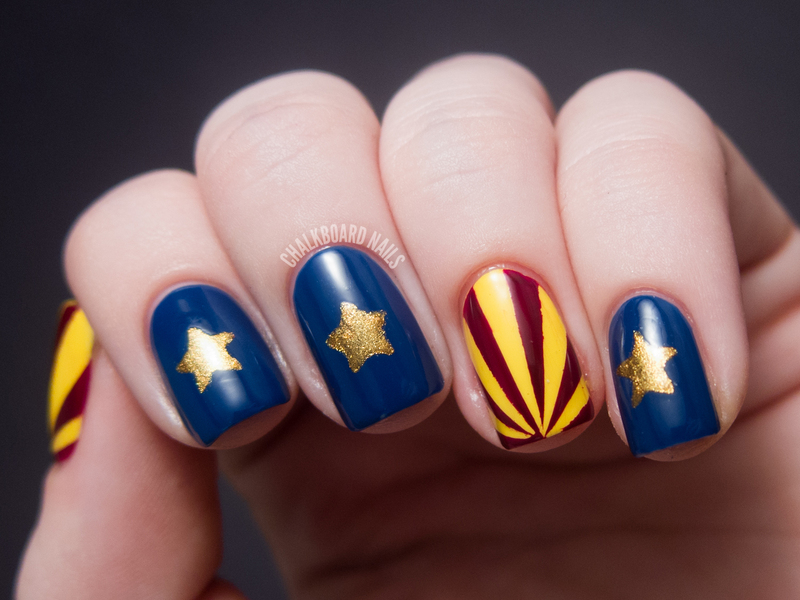 For "inspired by a flag" I chose to depict the Arizona state flag. This prompt seems kind of out of place to me… a flag is so random. I feel like the person that created this challenge had a specific idea in mind for some nail art they wanted to do and then wrote this prompt to fit it. Since I know you came here to learn, here's some history on our flag. There are thirteen rays on the top half, and they represent the original thirteen colonies. The colors are also representative of the awesome sunsets that we have here. 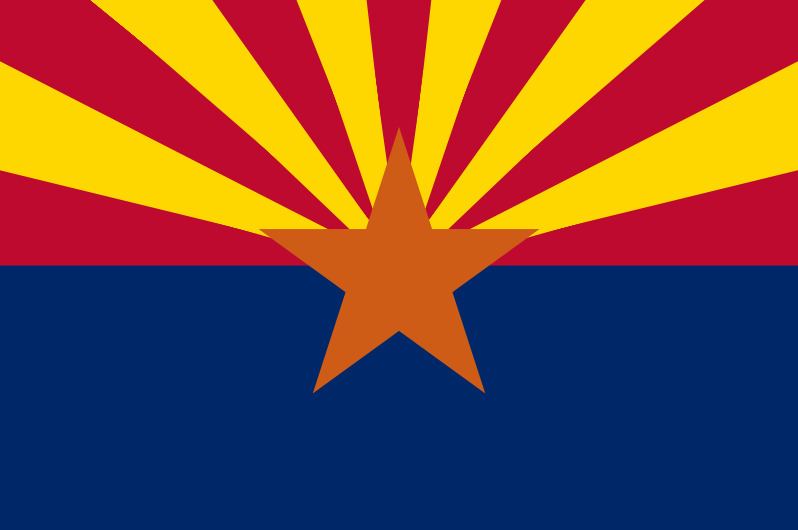 The copper star represents the Arizona copper mining industry, and the blue stands for liberty. For this manicure I used two different tape techniques. 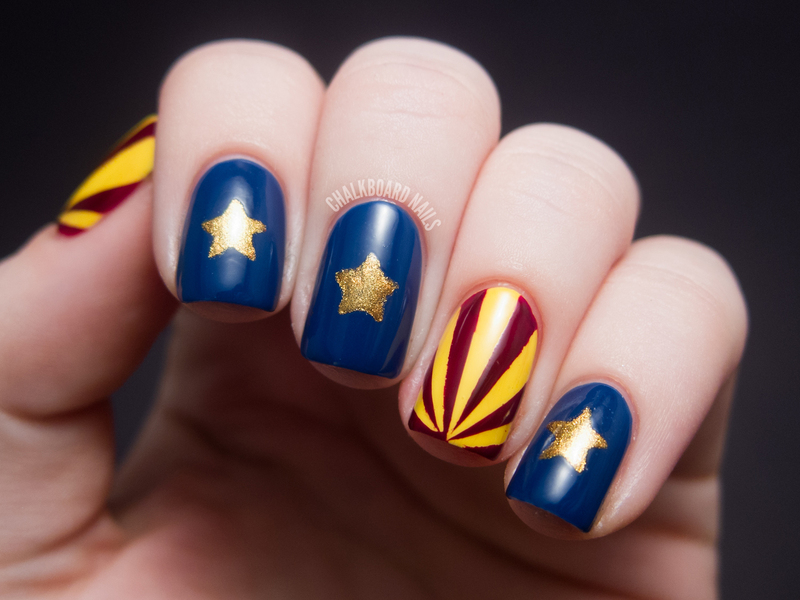 On the star nails, I used the same technique that I outlined in my Fourth of July tutorial: hole punch some painters tape and use it as a stencil. 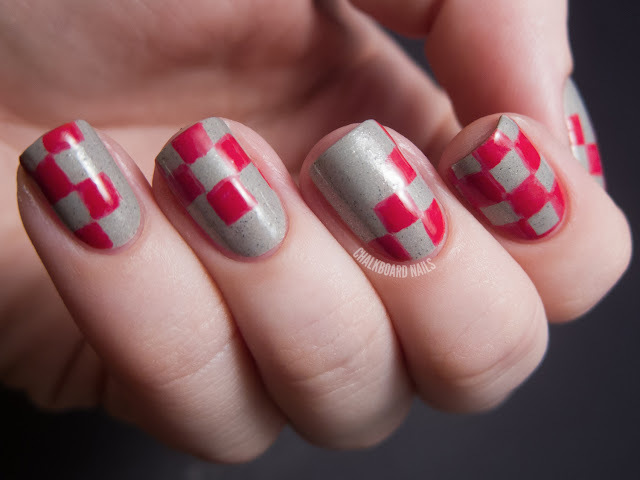 On the ray nails, I cut super skinny triangles of tape and then arranged them on my nail so the points all met at at the base of the design. 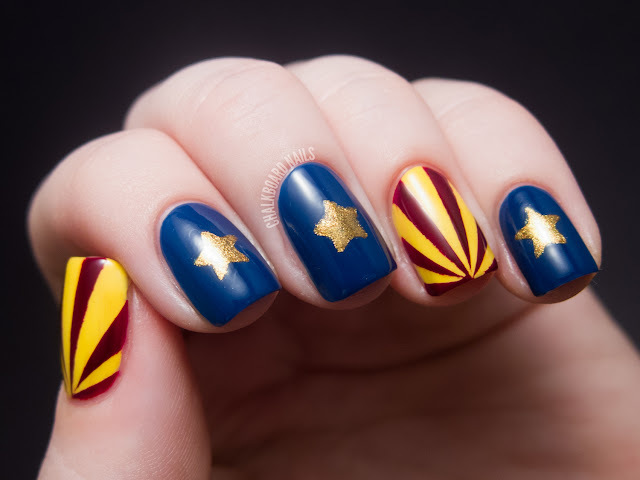 Then, I painted over the nail with my second color and slowly removed the pieces of tape. 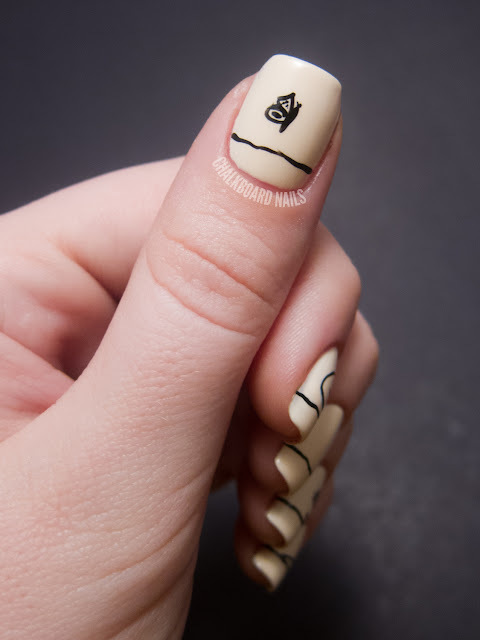 As with any tape manicure, make sure your base is completely dry before taping. 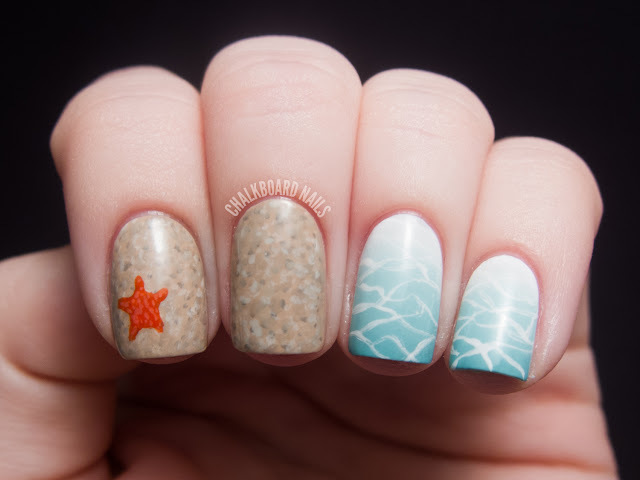 I like to use Seche Vite Fast Dry Topcoat to speed up the process. The navy in this manicure is China Glaze Man Hunt. 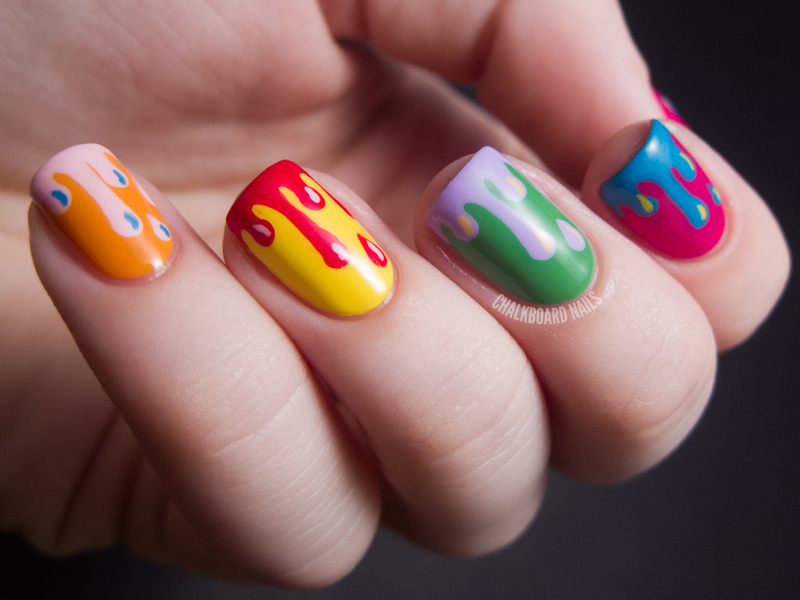 I used two coats for opacity. It's a really great shade & applied evenly. 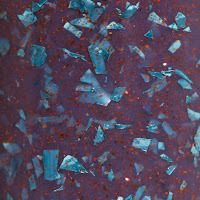 The stars are OPI Legs Celebrate, an older OPI that my sister gave to me. The yellow is China Glaze Happy Go Lucky, my go-to yellow creme. The red is China Glaze Velvet Bow, which was a little streaky and required an additional half coat before removing the tape. My choice of red may have ended up being a little dark, but I wanted to avoid the McDonald's look again since I was separating those colors from the blue nails entirely. I'm happy with it, anyway! 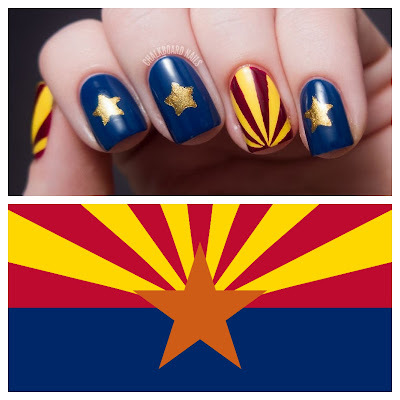 Last year's inspired by a flag can be found here, and challenge prompts here. Good afternoon! 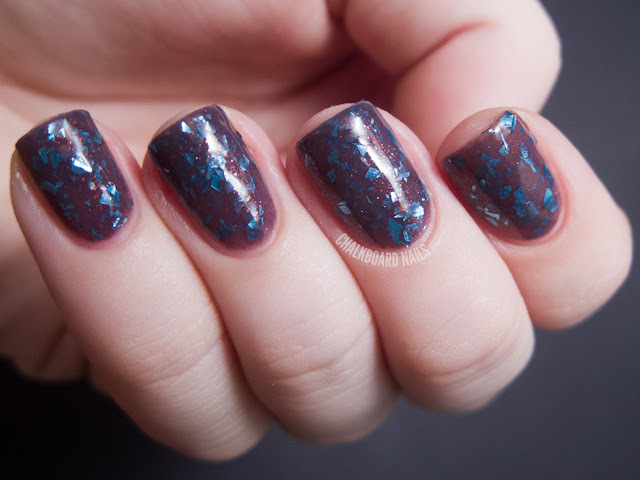 I've got some polish from Sassy Lacquer's Fall line to share with you. 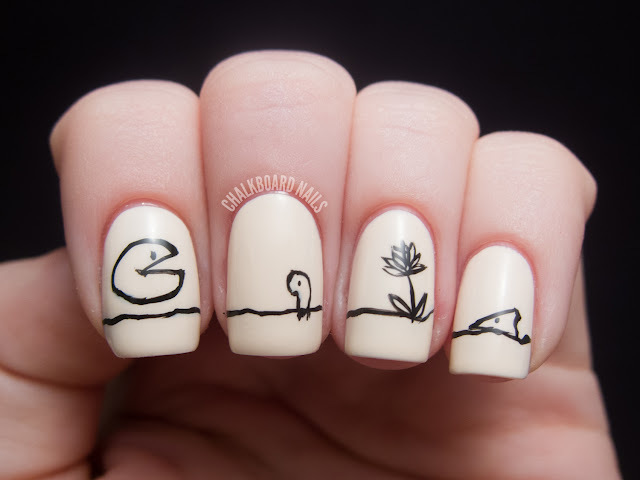 All three of these polishes are really varied and interesting! Let's get started. 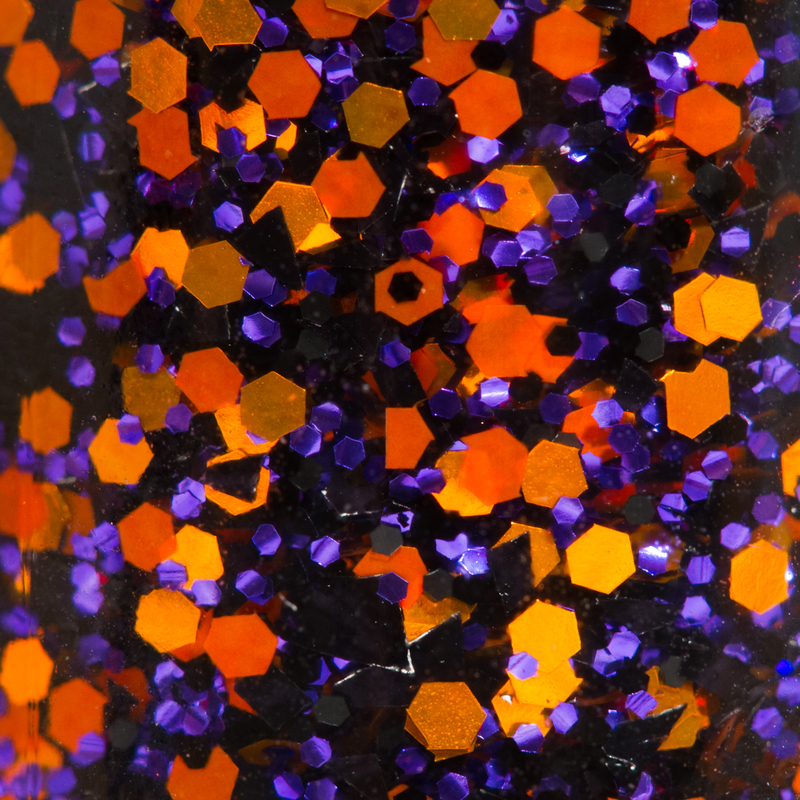 All Hallow's Eve is a glitter topper made of black, metallic orange, matte orange, and purple glitters, as well as black shards. 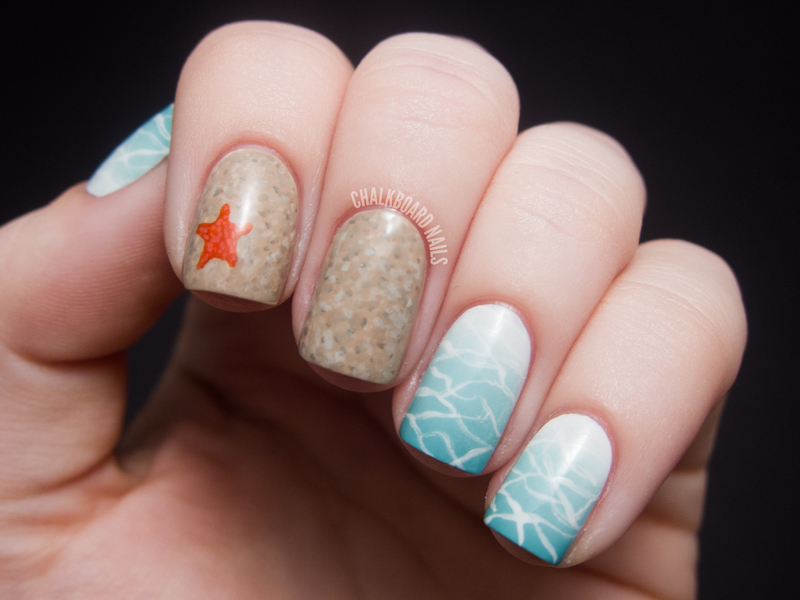 It comes in a clear base, so it is best used as a layering polish. 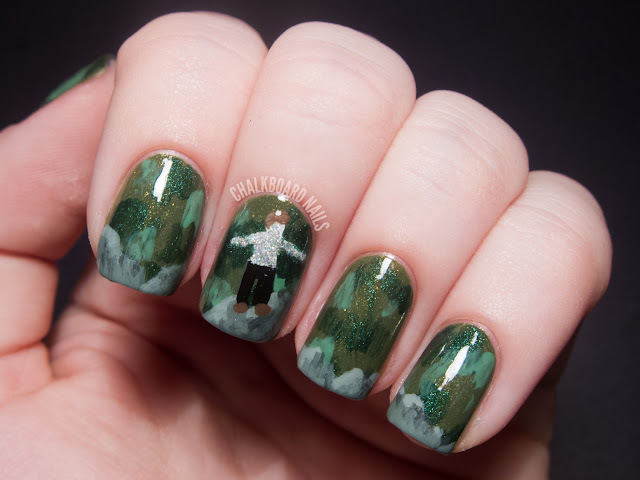 I've shown it here over OPI Who the Shrek Are You? It's a great Halloween Shade and I LOVE that there is so much black glitter in it. Application was easy. 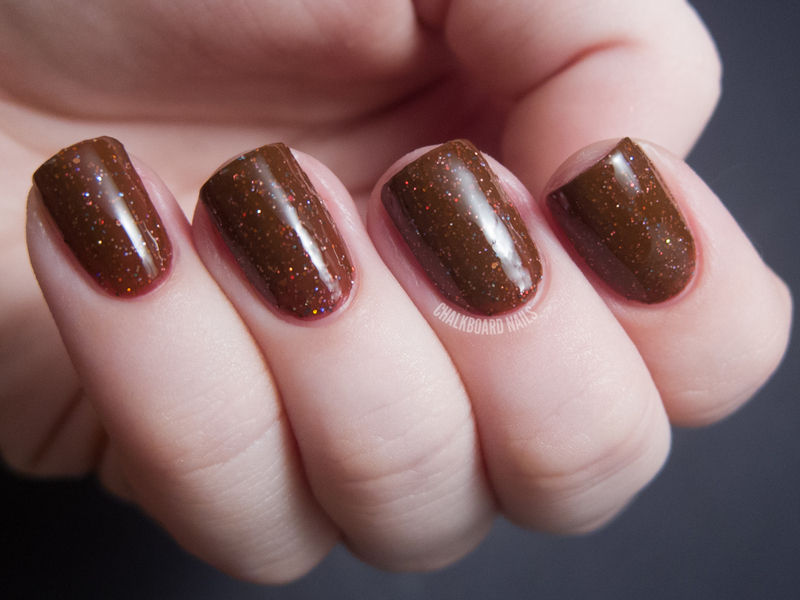 Mulled Cider is a slightly red-toned brown polish with lots of microglitters in it. There are holographic gold and silver, as well as teal! The holographic glitters are obviously quite sparkly and add a lot of dimension to this polish. This is two coats of Mulled Cider. The glitters in this polish are pretty topcoat hungry, so I used two coats of that, too. Wizard's Fire is a super unique polish. 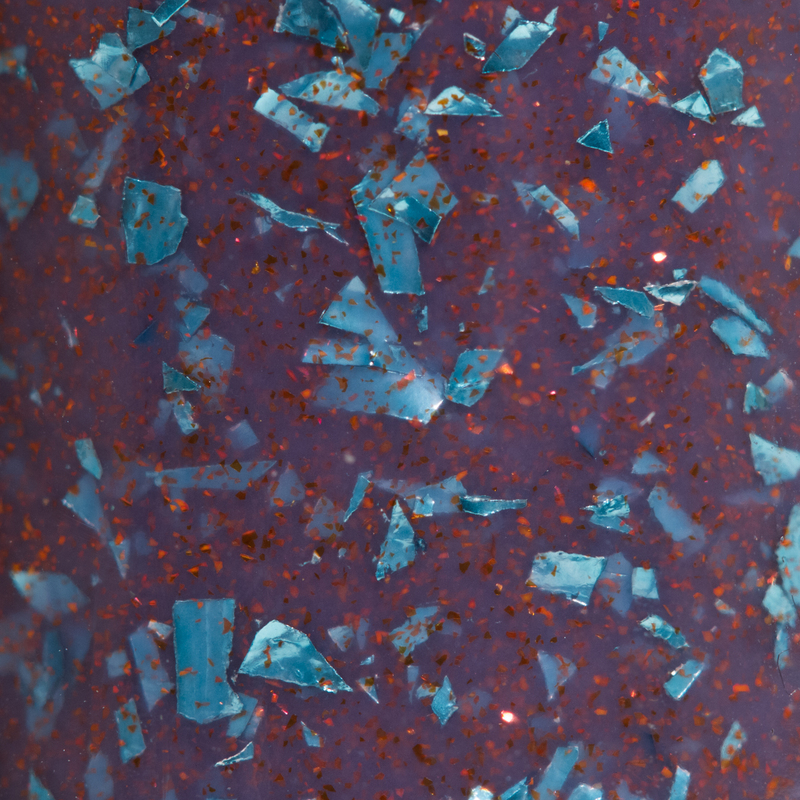 It is a sheer greyed-purple jelly with teal shards and copper microglitter. I've shown three coats of it alone here, but I bet it would also be amazing layered over a dusty purple creme. 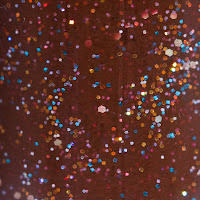 The copper microglitter is what really makes this polish go from cool to AMAZING, in my opinion. 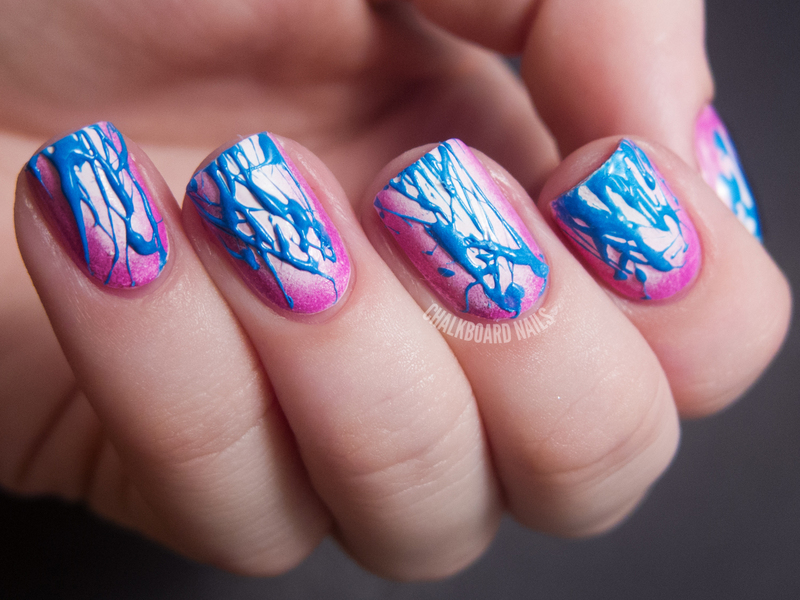 It can be a little tricky to apply, because of the irregular shards, but I'm sure it's nothing you can't handle. Sassy Lacquer polishes are 3-free. 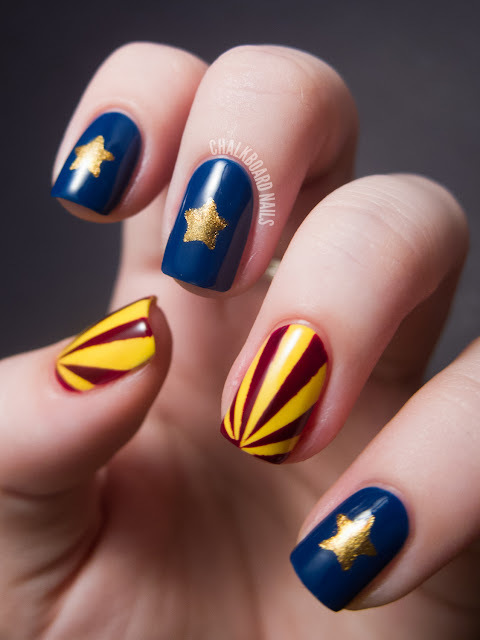 Carrie also offers custom polishes for people that are interested in designing their own! Sassy Lacquer polish is sold here. You can also check out the brand's Facebook page for more information. 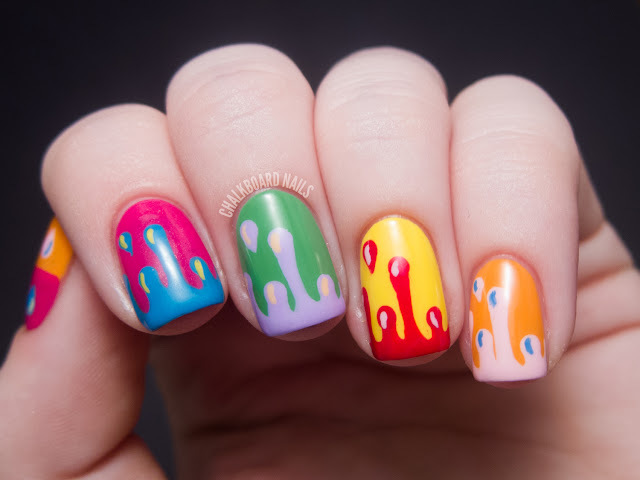 It's finally time to announce the winner of my Cool or Warm Colors Nail Art Contest! My panel of judges and I have deliberated, we've made it through a number of judging rounds, and we've chosen our favorites. I hope that you will respect the decision we reached. If only I could give a prize to everyone! Samantha from Pack a Punch Polish! Congratulations Samantha! The judges loved your friendship bracelet inspired design. Additionally, there were two entries that I liked so much and just couldn't let go unrewarded. I will be sending each of these ladies a small runner-up package on my own. Great work Allison & Rachel! Finally, I want to say a HUGE thank you to all of you that took the time to enter this contest! There was so much talent and I am so lucky to be surrounded by so many skilled artists! Inspired by a pattern. I was kind of stumped on this one. 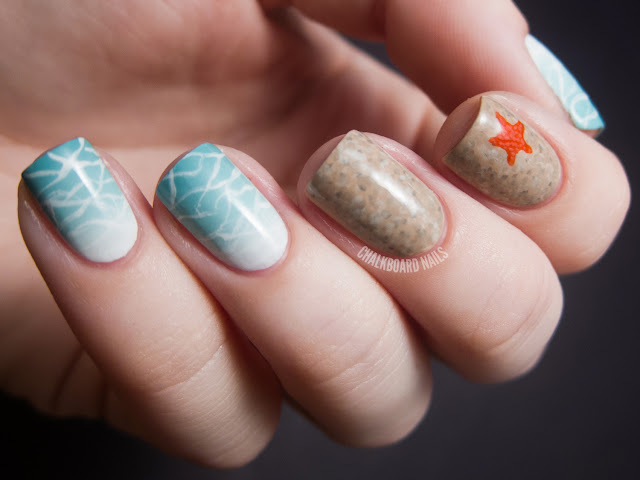 I spent so much of my time last night doing those Beauty and the Beach nails that I didn't leave a lot of time for myself to do pattern nails. 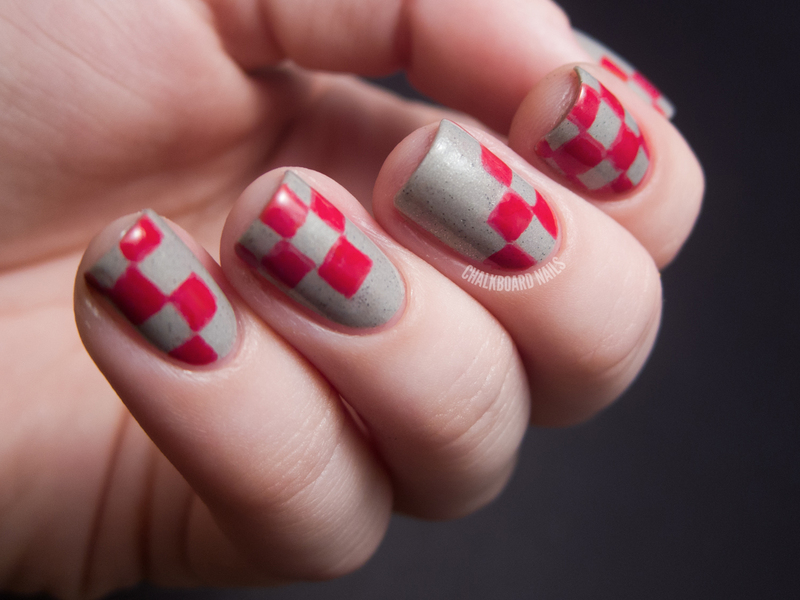 I decided to do checkerboard nails. These are freehanded checkers that I did with my medium striper. 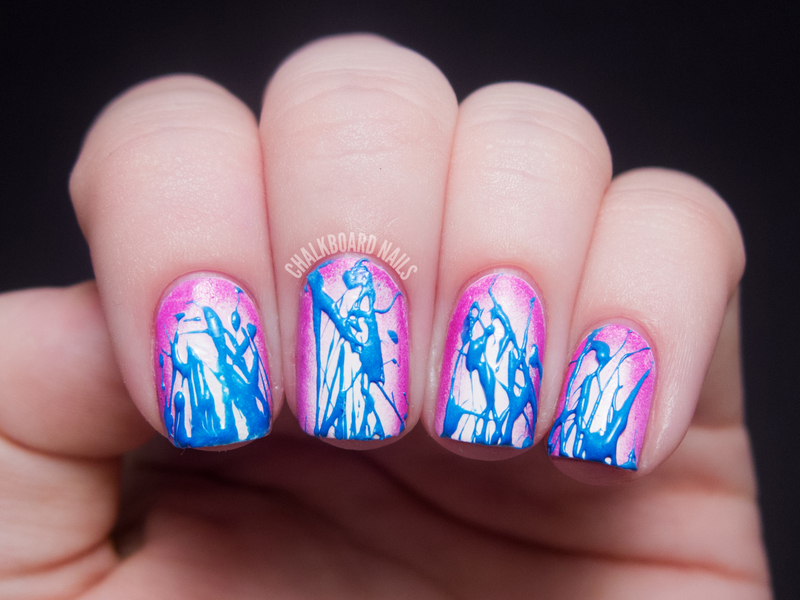 The base of this manicure is Essence The Dawn is Broken. The pink is Zoya Renee, which I have a terrible history with as far as getting it to photograph correctly. It's kind of a neon pink and it photographs tomato red on my camera. I did my best to color correct here but it's probably not 100%. 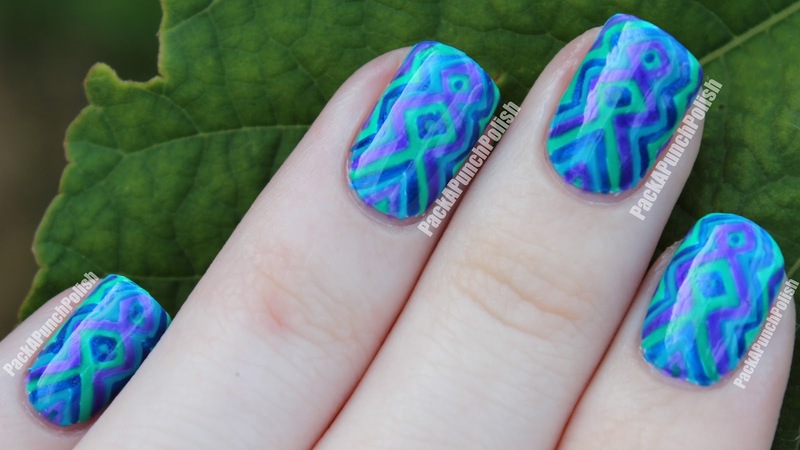 You can see last year's pattern nails here, and challenge prompts here. Good afternoon! The second post of the day today features some pretties from Vivid Lacquer. I've also added two Vivid Lacquer polishes to my Ultimate Black and White Glitter Comparison post so make sure to check that out as well! First we've got Have Fun Storming the Castle. This polish is full of gold and blue flecks and shimmer, plus blue and black glitters. 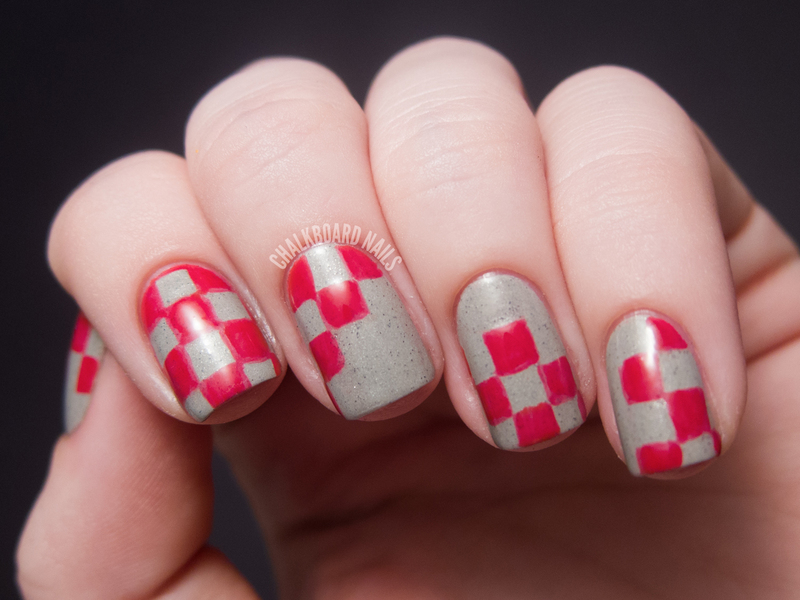 I've shown one coat here over butter LONDON Sprog. HFSTC applied beautifully and ended up being a surprise frontrunner in this lineup for me. Hivemind is a yellow and black glitter topper, shown here over China Glaze Recycle. 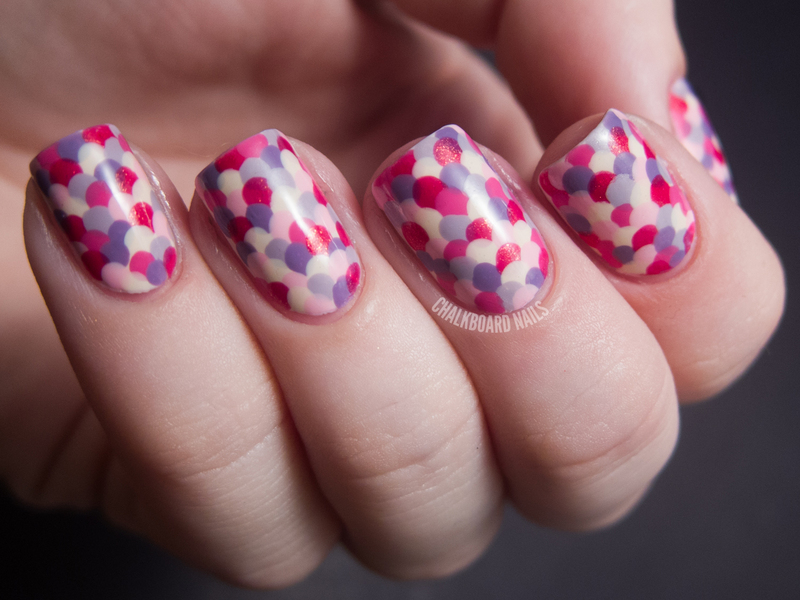 The color combination is very striking and the flower shaped glitters are a nice touch. 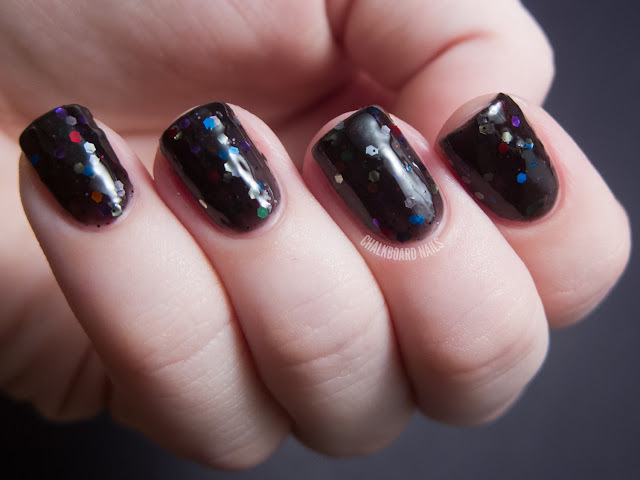 The jumbo black hexes in this polish are curled, though if you pay attention when applying that can work in your favor. As you see, I made the curl of the large black glitters follow the curve of my nail, and they laid flatter that way. Notebook Paper is a fun back-to-school polish that is made up of white, red, and light blue glitters. I love the superfine bars in this one. I had a little bit of trouble applying this one due to glitter density, but enjoyed the finished look. 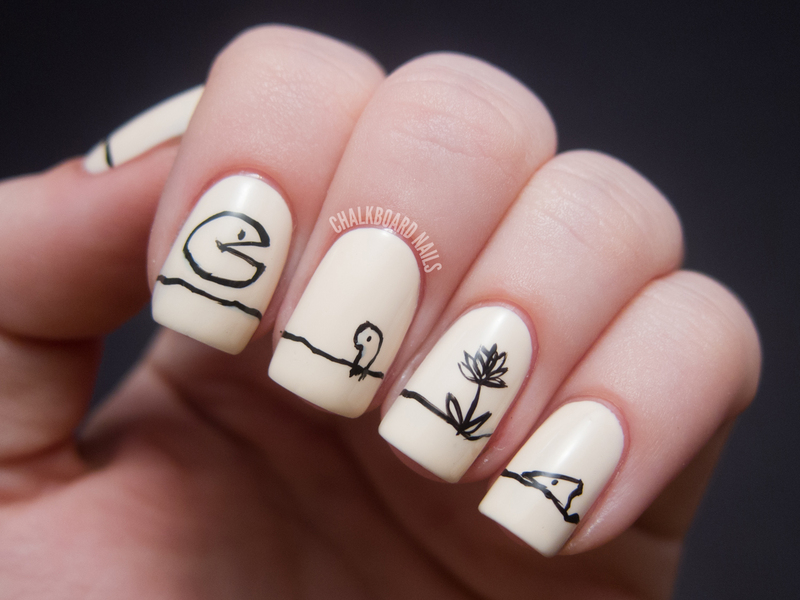 I have shown it here over Zoya Kristen. 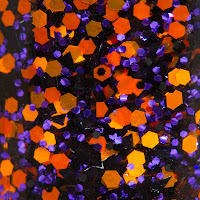 Assemble is a black jelly polish filled with multicolored glitter. It's a fairly dramatic polish and would be good for those of you that like darker polishes but still want a bit of color, too. This is three coats alone. I found the consistency of this one to be a little thick and that made it a bit of a challenge to apply. 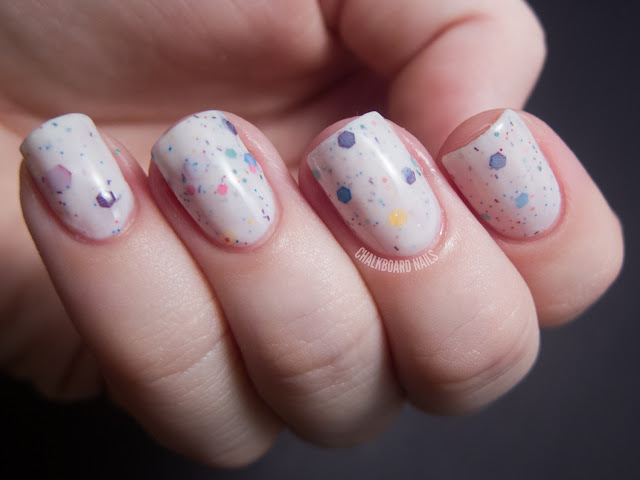 Fairy Bread is a member of the "white base with glitter family" of indie polish and this is a nice iteration. 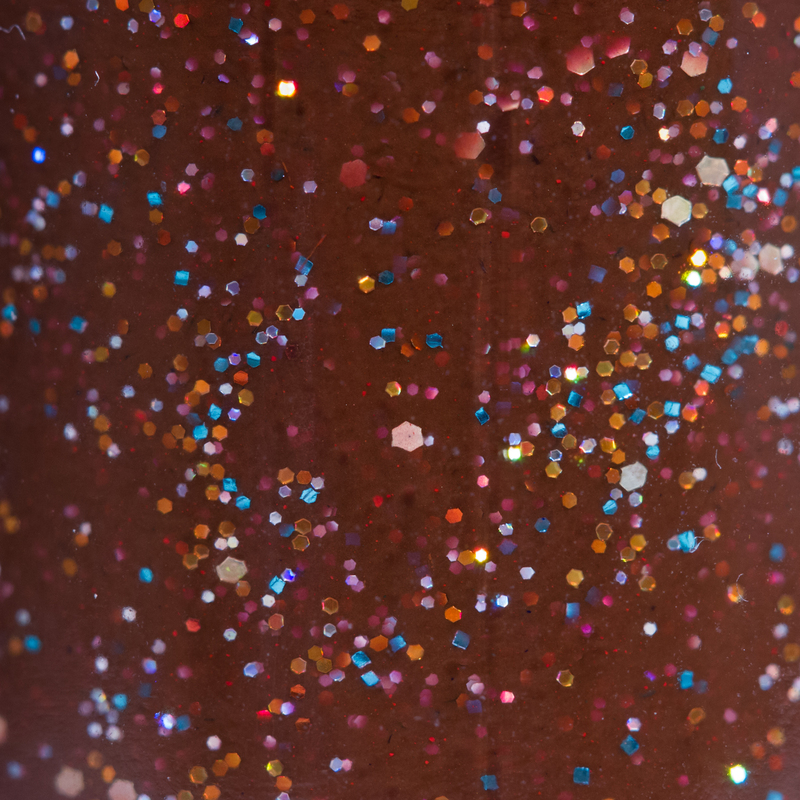 The base is peppered with multicolored microglitter and even what appear to be micro bar glitters! The polish applied well, wasn't thick, and got even after three coats. Vivid Lacquer polishes are sold on Etsy (there are Halloween polishes in stock now!). You can also check out the VL Facebook page for more information on restock dates, new colors, and stamping plates. 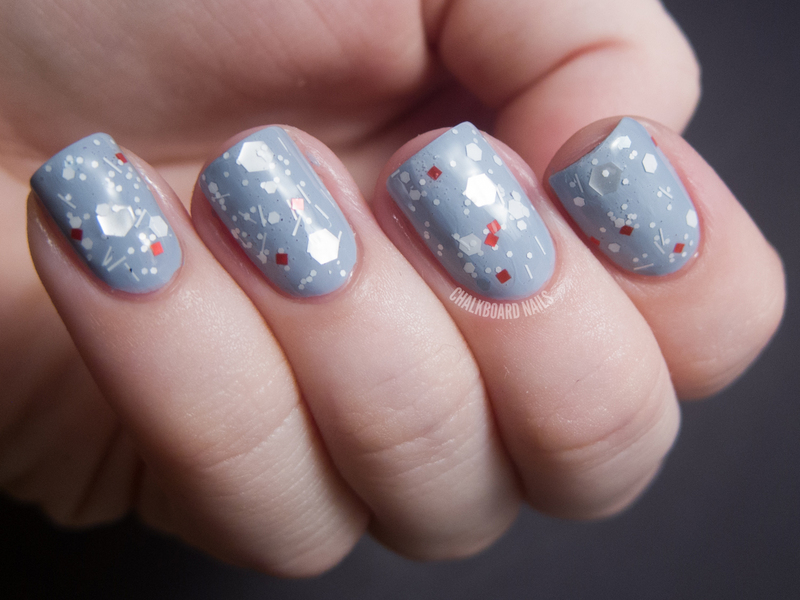 I began by painting my nails with two coats of OPI Alpine Snow. 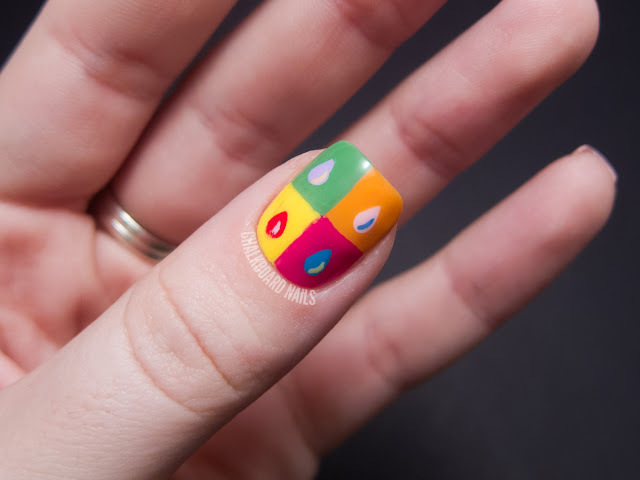 Once that had dried enough, I grabbed a trusty triangular makeup sponge and sponged on a bit of Orly Frolic around the edges of the nail. It was actually kind of challenging to get it to look right... round gradient-ing is tough. Then, I grabbed Orly Skinny Dip and used the spun sugar technique to add some globby strings. They ended up working perfectly and mimicked the weird splatter on the dress really well. You can find a tutorial for this technique here. While the technique worked out nicely for this specific look, I kind of disliked it otherwise. I definitely found it challenging to do. I had to practice a lot before I could get it to look like I wanted it to, and then once I got it down, I couldn't really topcoat it because it ruined the 3D look I was going for. Thick strings + no topcoat = never drying. 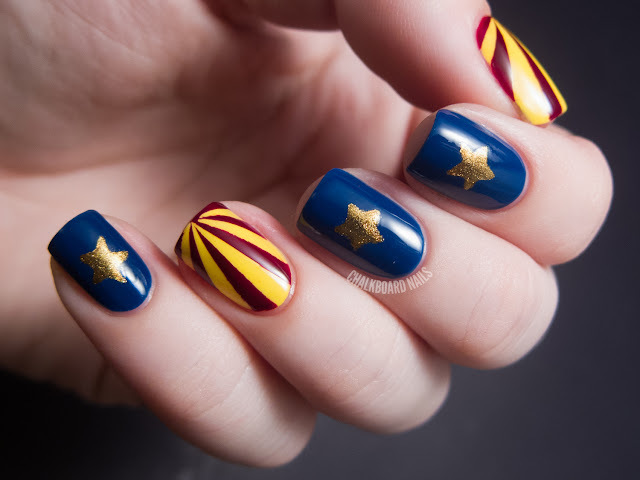 I've seen some great applications of this technique that looked good with topcoat though, so it's potentially just my inexperience or maybe the polish that I used. Here's a full shot of the dress that I used for inspiration. The model has kind of a funny expression, but a lot of the photos from the Betsey show were like that. I'm sure they were encouraged to walk with personality! I think I did a good job at capturing the dress, and it was nice to push myself to try something new. 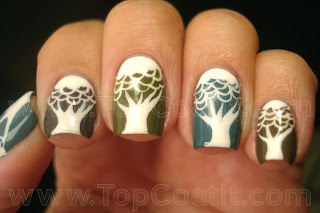 You can check out last year's fashion manicure here, and upcoming challenge prompts here. Today's "inspired by a book" manicure was inspired by The Missing Piece by Shel Silverstein. It's a beautifully simple children's book about a circular shaped creature whose body is missing a wedge shaped piece. It goes on a journey to find the piece that will fit perfectly in with it. While on its journey, it meets worms, smells flowers, and lets butterflies land on it. It meets pieces that are too big, too small, too sharp, too square. It even meets pieces that fit, but then holds them too tightly or not tightly enough. When it finally gets it right, the creature realizes that it can no longer do the things that it used to love to do, and continues on, leaving the piece behind. The book is filled with simple and lovely illustrations and I did my best to mimic the style. This manicure only has two "ingredients": Lime Crime Milky Ways and my It's So Easy Nails Stripe Rite in black. As you can see, I've shown the creature, its worm friend, the flower it stops to smell, and the missing piece. On my thumb I showed the butterfly that landed on the creature. When the piece was a part of it, it rolled too fast for the butterfly to land on it anymore. That was one of the things that it loved that it couldn't do with the piece. "This fable can also be interpreted to mean that no one should try to find all the answers, no one should hope to fill all the holes in themselves, achieve total transcendental harmony or psychic order because a person without a search, loose ends, internal conflicts and external goals becomes too smooth to enjoy or know what's going on. Too much satisfaction blocks exchange with the outside." 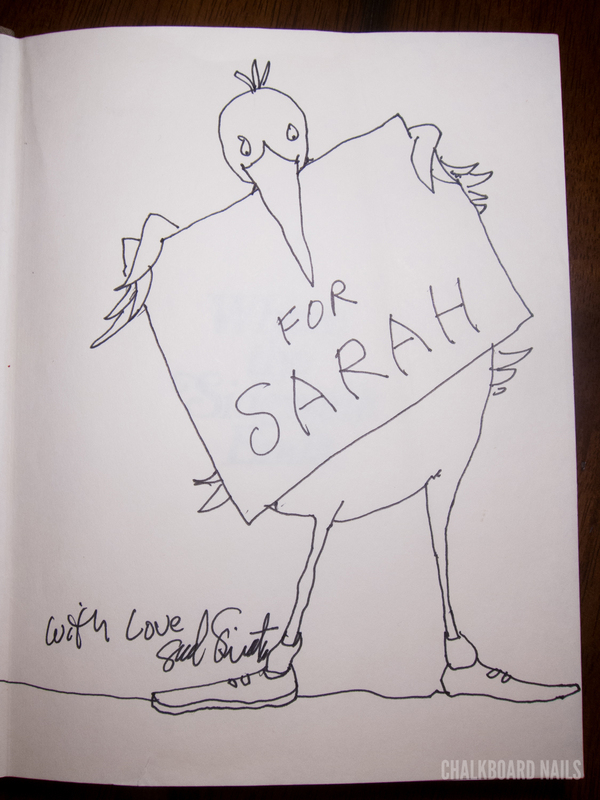 My grandma Mo used to read this (and lots of other Shel Silverstein books) to me and my sister when we were growing up, and these books are really special to us. 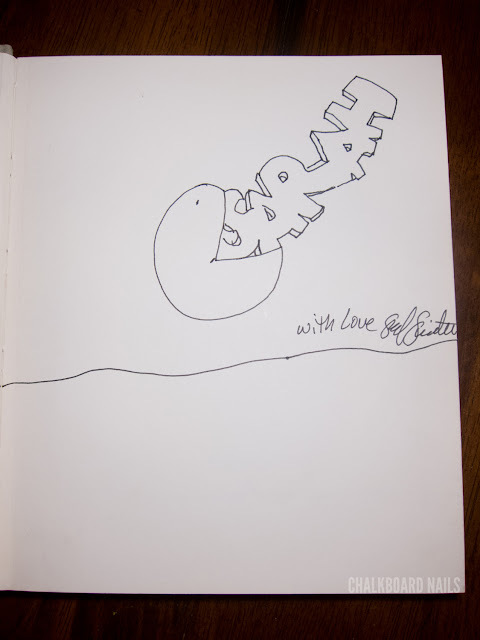 This one below is the one that is in my copy of The Missing Piece. 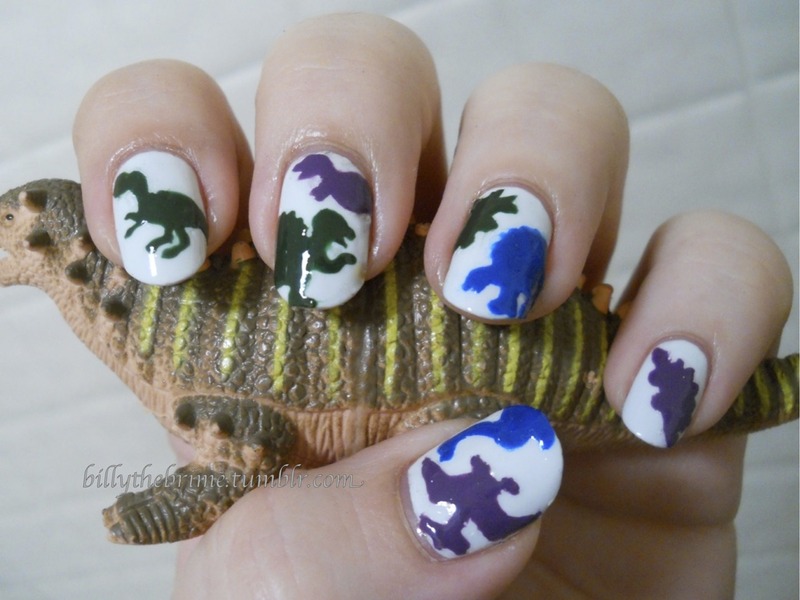 Last year I did nails inspired by Chuck Palahniuk's Invisible Monsters. Check out upcoming challenge prompts here.